Is it me, or do weekends fly by way too fast? In some ways, I look forward to getting back to our routine, but in other ways, I like the lazy days weekends can provide. 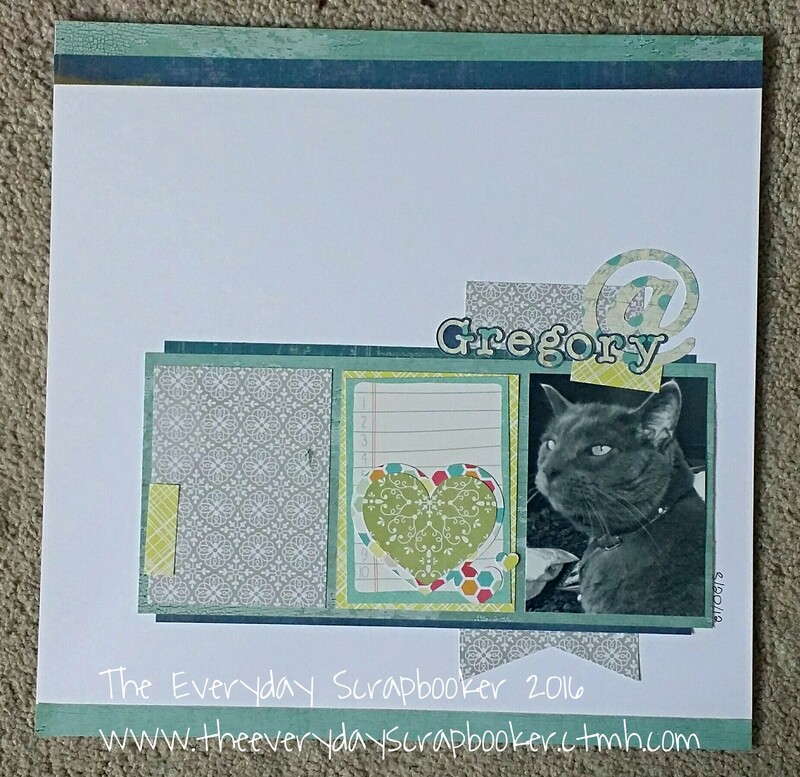 I have another layout to share with you today. I’m so excited to share it! This layout is an absolute fave- I love it! I used a mixture of CTMH Urban and Seaside and SU patterned papers. You’ll also find a journal spot from Echo Park. How does the sketch inspire you? Ah, finally a day to sleep in. I just wish we could sleep in! You know your routine is set when your kids manage to wake up around the same time everyday, whether it’s a school day or not. It’s hard to tell by the picture, but it was warm, soggy and slightly muddy in places. 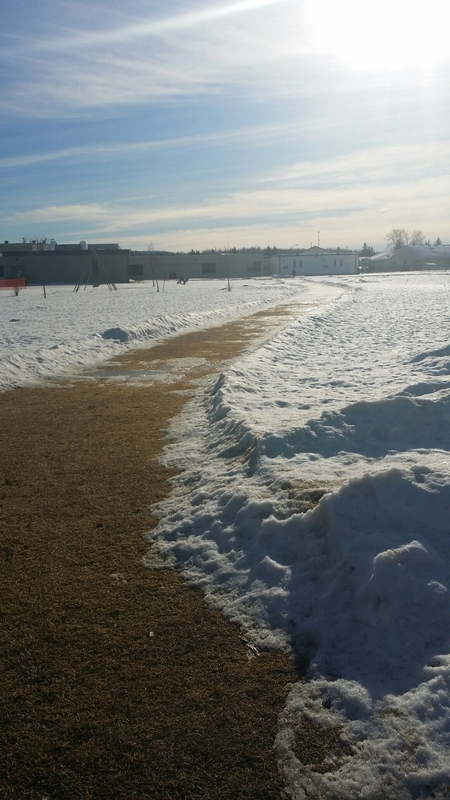 The school has kindly plowed trails on the playground for us walkers. It’s crazy seeing grass, right?! Two things baffle me: the grassy sight above, and the ice that lurks around bends, in the shade and right out in the open. For February, this is just wrong. Sadly wrong. The layout I shared above is happily cheerful and warm feeling- much like Thursday was! The papers are SU, but the washi is CTMH. A layout I found on Pinterest inspired this beautiful, clean and simple LO. It’s saved here. Thanks for visiting! I’ll be back again soon with more creative inspiration! It’s Friday! You made it through the week! Now what are you going to do? 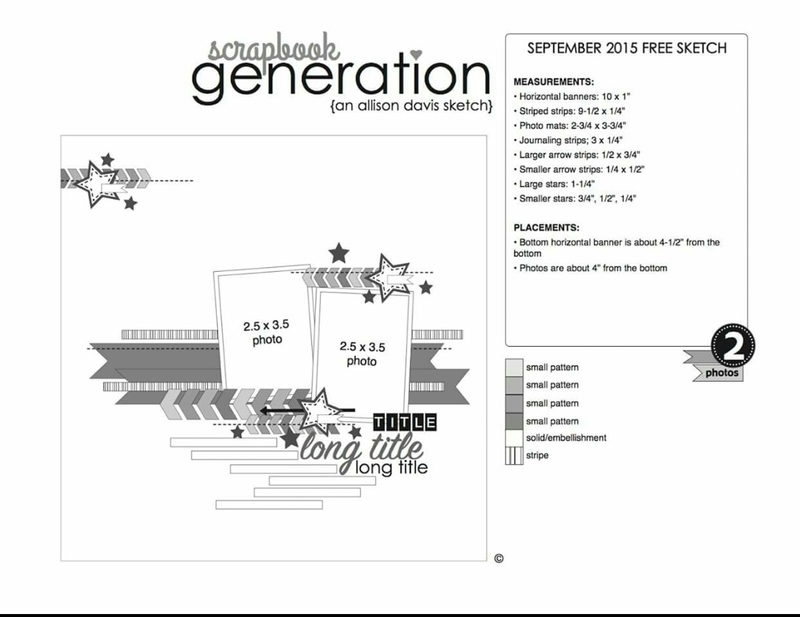 You should join me and participate in the online crop happening over at Scrapbook Generation (Scrap Squad- on Facebook) this weekend. Using the search bar at the top of the page, type their name in then find the posts (there’s a lot of them!!) sharing all the juicy details. I believe there’s an event page on Facebook, too. Won’t you play along? I officially ran out of pictures to scrapbook today. It’s a good thing my next order of pictures has already been shipped! It’s also a good thing I’ve got a good stockpile of projects to share with you until I’m able to play again! As you can see, pulling their shirts up became a bit of a game. They were rewarded with tickles every time they did it! I hope you enjoy today’s project and I hope you enjoy your weekend, as well! Hello friends! The week is nearly over. Are you excited for the weekend? I am. 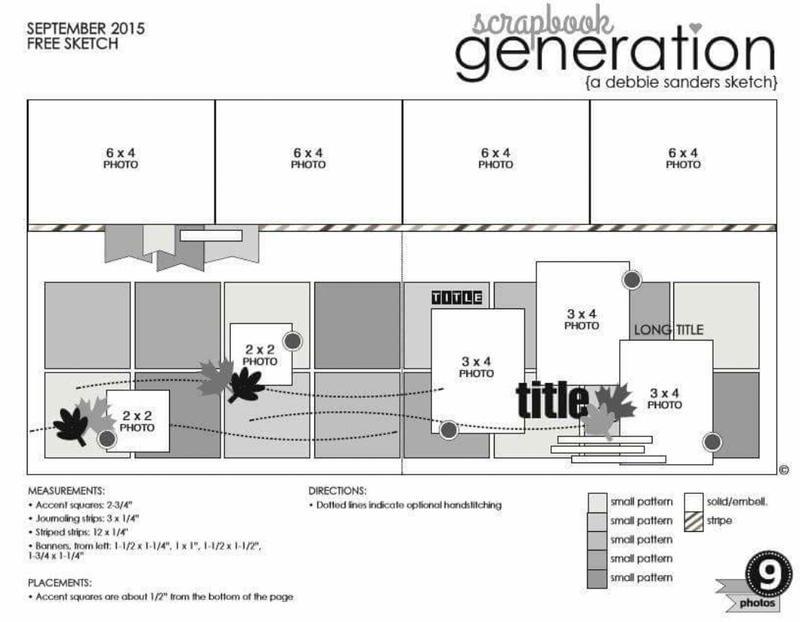 I’m participating in another online crop at Scrapbook Generation. You should check it out- it starts tomorrow and ends Sunday. There’ll be lots of games, chatting FUN and prizes to be won! 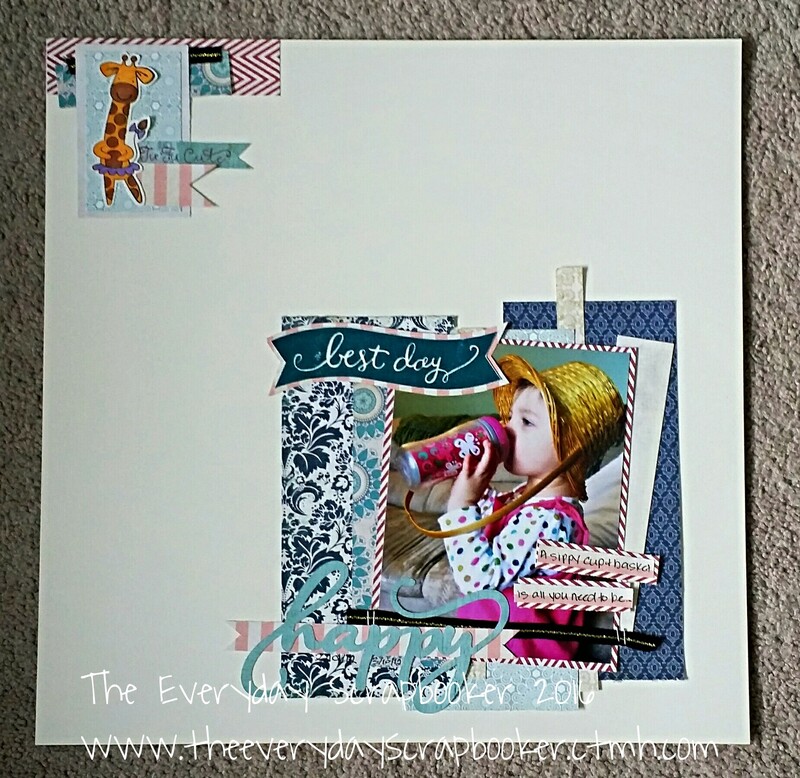 I’m stopping in today with another layout to share with you! 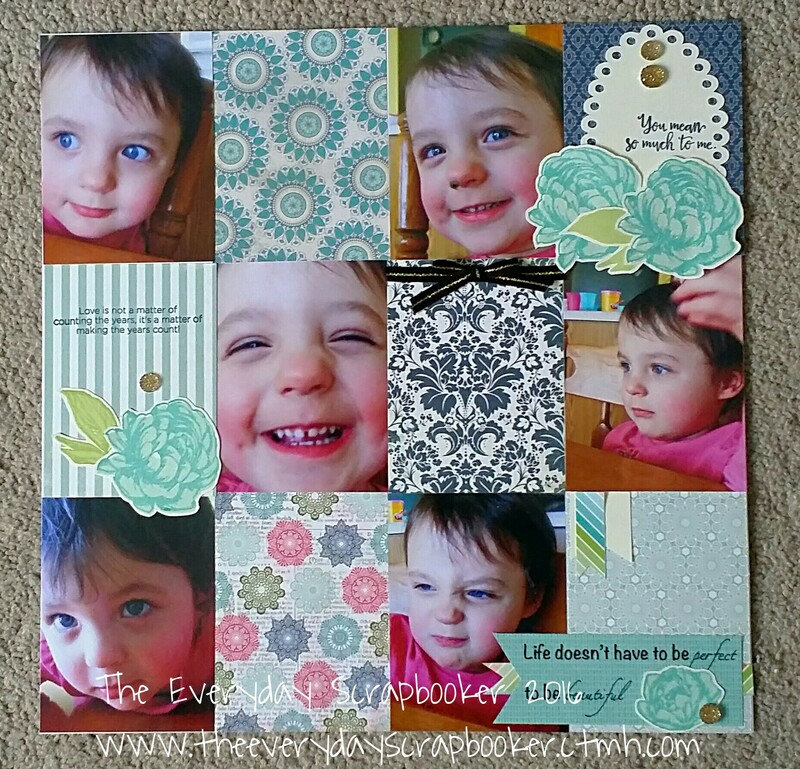 I used Charlotte on this layout and bits of CTMH Blossom and Snowhaven patterned papers. 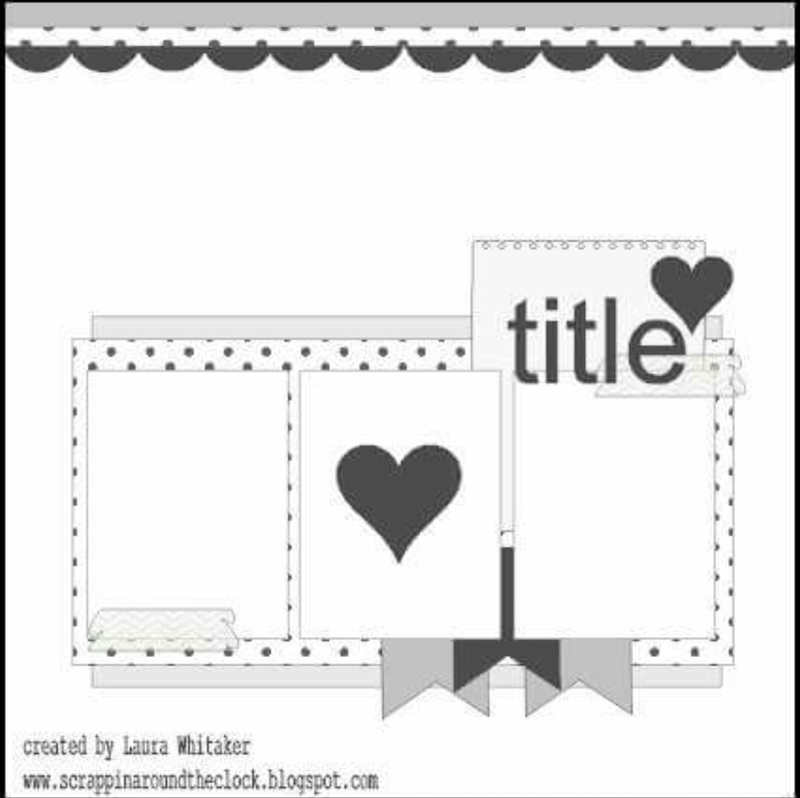 To create the title, I used the negative portion of the die cut and layered one inch strip of patterned paper behind it for some depth. Lastly, I scattered some black sequins around the page to help embellish my page a little bit more. Please join me again tomorrow for more inspiration! Happy hump day, friends! I’m just dropping by with a quick post. 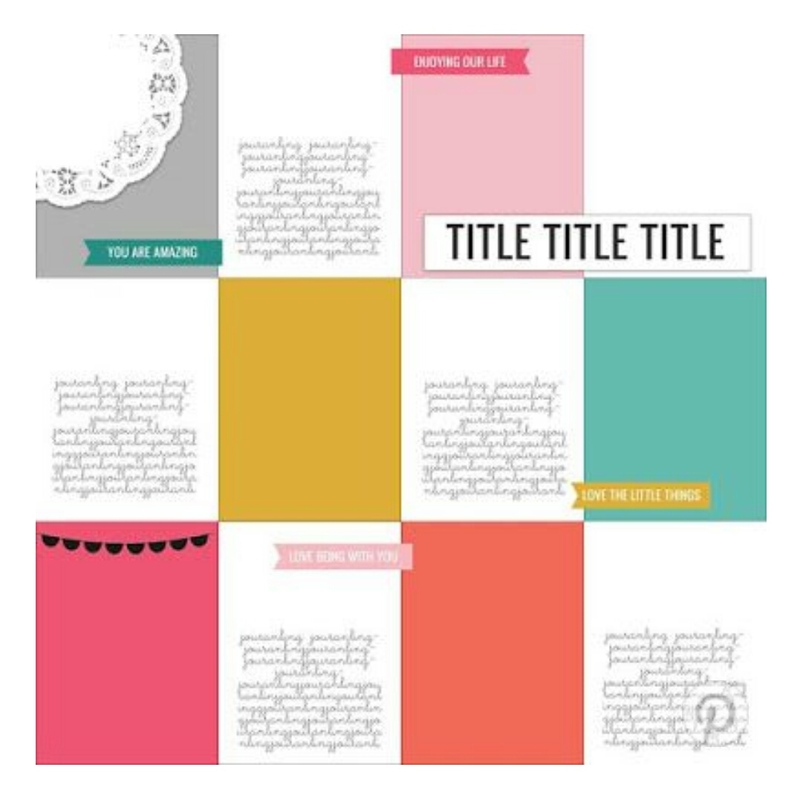 I’m sharing another layout I created using sketches over at Scrapbook Generation. This one was posted on January 15 for Free Sketch Friday. As you can see, I flipped the sketch around and made it my own. I used a mixture of 6×6 papers as well as CTMH stamps (Woodland Romance and Ballet Safari). How cute is the giraffe in the top left?! I stamped it using Staz-On ink, then colored it in with my Shin Han markers once it was dry. She needed a purple tutu in homage of my youngest twin- it’s her favorite color. 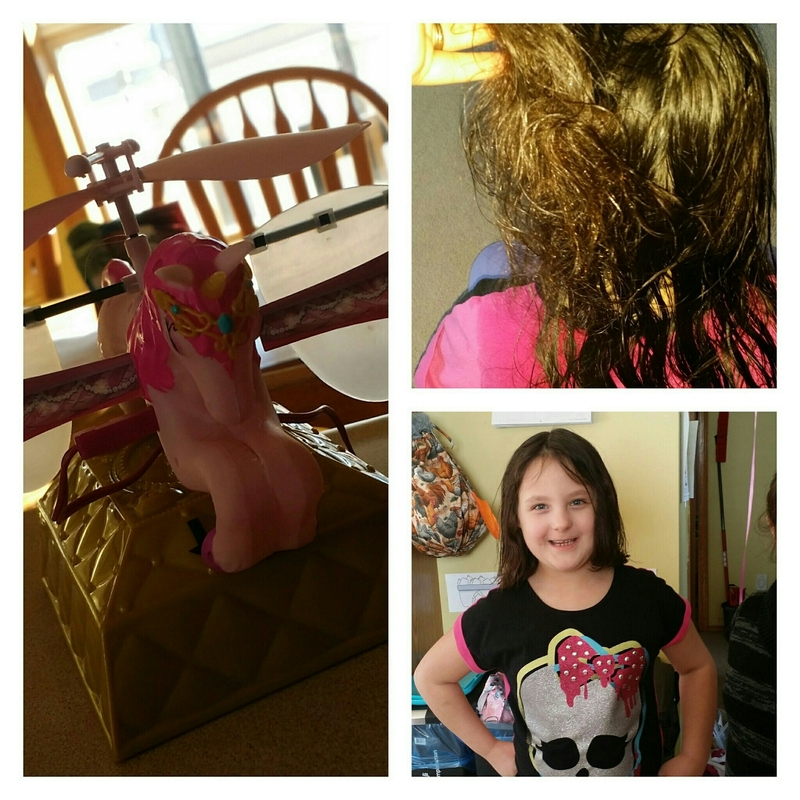 Today marks the first time either of my daughters has had a real hair cut. And, by real, I mean more than just a trim. It was more than just cutting out the split ends. We cut so much of it off that my stomach and heart physically hurt today. The twins had their birthday party yesterday. They had an absolute blast. So did I, actually. When miss A got that flying unicorn badly twisted in her hair- that didn’t matter. Much. I would hopefully be able to brush it out later on, even if I did have to cut a tiny bit of her hair to get it out. Throw it in a pony tail and keep going. Shampooing, conditioning, butter, olive oil, brushing, combing and more conditioning didn’t help. As a last resort, I sent M over to the neighbor to ask her to come over and help me out. She did, bless her heart, and the bottom right picture is the result of our efforts. We cut out a good 6 to 8 inches of hair off her head. Probably even more (I think that’s a conservative estimate). A cried, and I nearly cried, but in the end we love it. By “we”, I mean my daughter. I’m still disappointed we had to cut it. At least it’ll grow back. In an attempt to cheer myself up, I’m here to share another layout with you. Then, I plan to scrap. That ought to help! This sketch I found over at Krafty Kats’ blog inspired my layout. It was another submission in SG’s Superbowl Sunday crop challenges. Today’s the last day to get your entries in! Good luck! I used a mixture of 6×6 papers, as well as CTMH Beloved Bouquet, using the base and shade technique. More on that later! Four screaming 6 year Olds and one little 2.5 year old are loud! We’re 30 minutes post birthday party, and I’m just starting to regain my senses. What in the world just happened?! My poor dog didn’t know what to do with himself. He followed me around like a shadow! If I sat down, he cuddled in my lap. Now, he’s cuddled on the couch next to me. 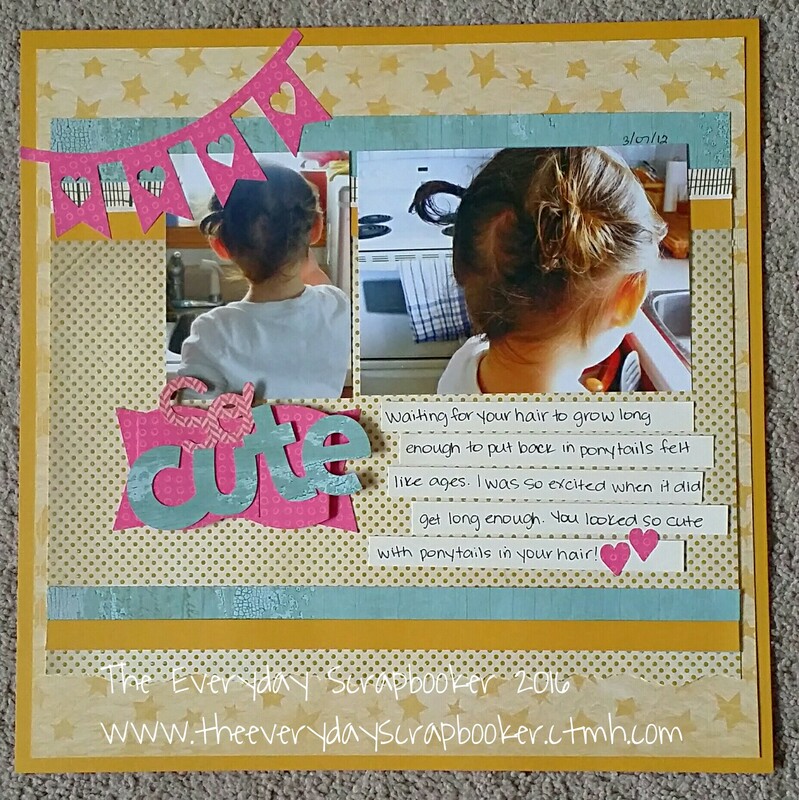 I have another layout to share today that is almost as energetic as the kids at our birthday party today. The design for this page is out of my ordinary, but I’m loving the finished product. 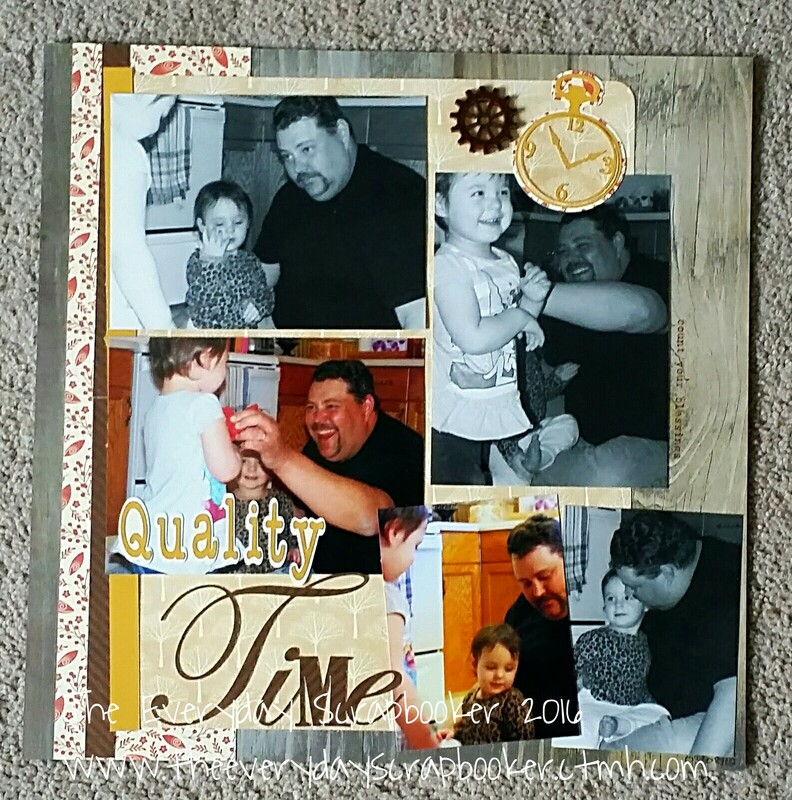 I created it as part of the challenge fun over at Scrapbook Generation on Facebook. Note: I mentioned in yesterday’s post that you have until the 22nd to complete the challenges, in error. It’s actually tomorrow at midnight CST! Don’t miss out! You could win a $25 GC to their Springfield LSS or online shop! I came up with the title, Strike a Pose, There’s Nothing to it, for the way sweet Addison is standing in her crib in the top left corner. It’s so sweet and yet cracks me up. She’s such a complicated mixture of sweet and obstinate. She’ll push you to the brink of insanity and then revert into a loveable, mushy teddy bear. I love her to bits and wouldn’t trade her for the world. She keeps me honest and on my toes! I used a mixture of patterned papers to keep my layout bright and energetic. I cut the background using my cricut and stamped most of the title and hexagon embellishments. Lastly, I cut ‘vogue’ using my cricut, as well. I hope today’s layout inspired you to create something that’s typically outside your comfort zone! I’ll be back again soon with more layout inspiration! Hello friends, today I have another layout I created for the crop I participated in a few weeks ago. 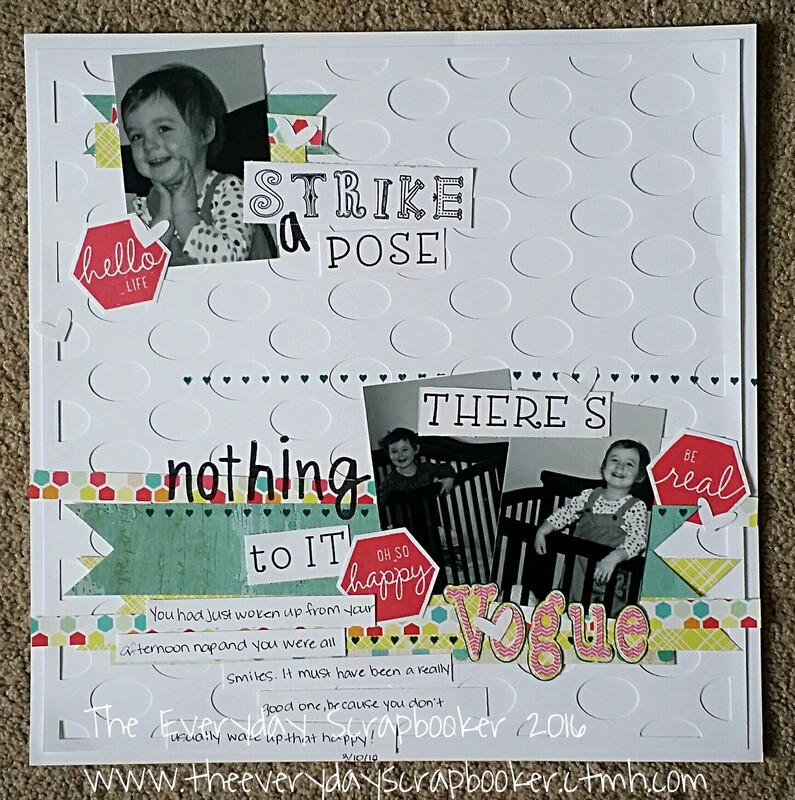 There’s still a bit of time to play along- head over to the Scrap Squad by Scrapbook Generation on Facebook and check it out! The deadline is Monday the 22nd. Here, I used a mixture of CTMH papers and used my Cricut to cut the title and watch embellishment. The wheel cog has been in my stash for eons, it seems. I’m pretty sure it’s Momenta. Enjoy your weekend! Tomorrow we’re celebrating the twins’ birthday. It should be a good time! 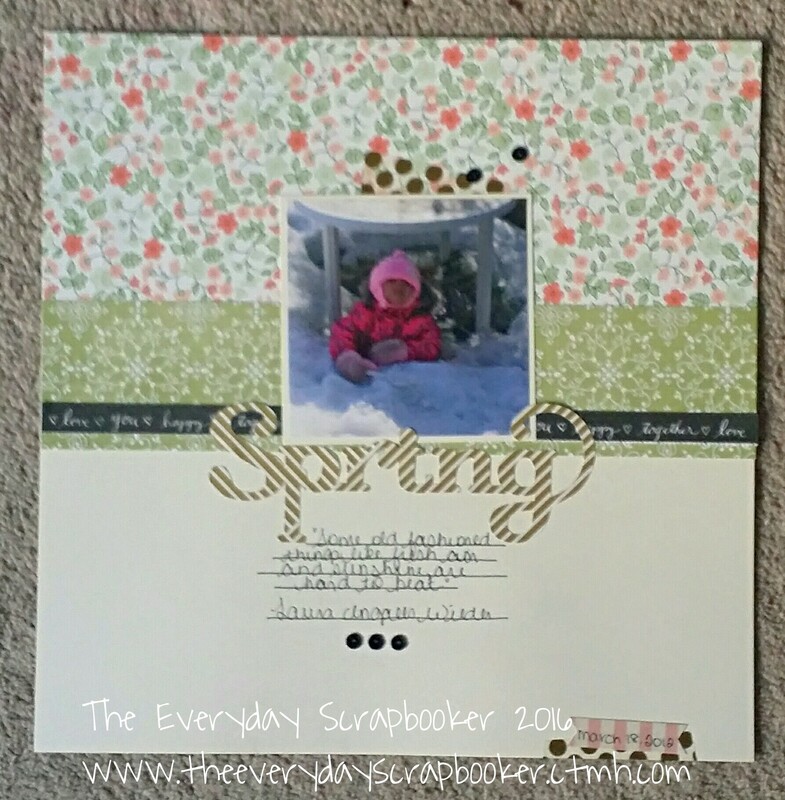 I’m stopping in today with another layout I created for Scrapbook Generations’ Superbowl Sunday crop challenge. This particular challenge was to create a layout using gold elements. Why gold? To celebrate 50 years of Superbowl Sundays. In addition to using gold, I also implemented a sketch I found on Pinterest. Originially, its a double page sketch, but I used only the left side of it. 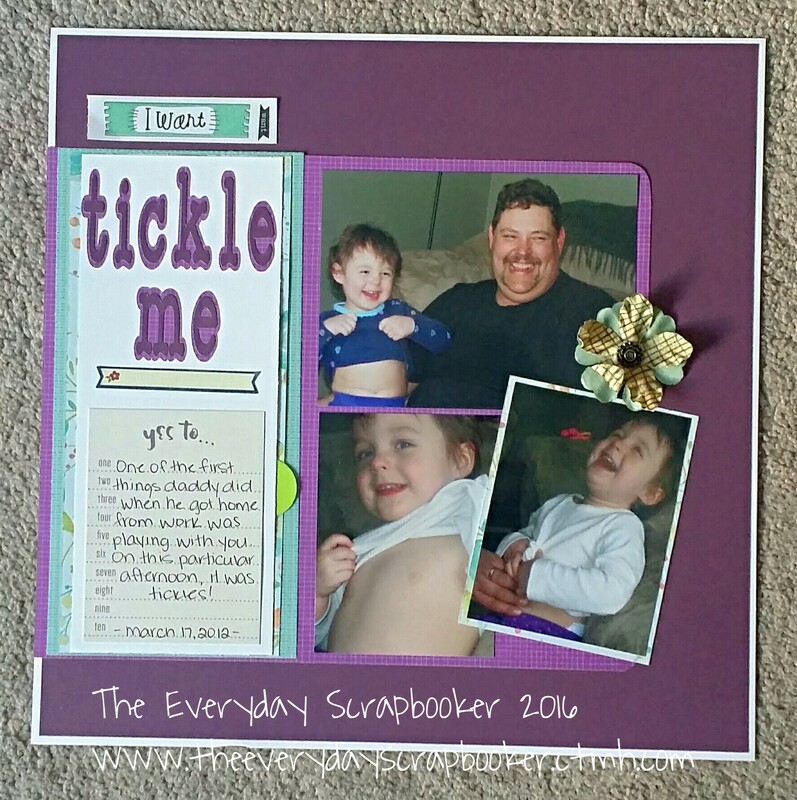 I only wanted to scrapbook two pictures on this layout. I used CTMH Saffron cardstock to create my layout base, then layered gold, glittery gold and CTMH Seaside patterned papers ontop. 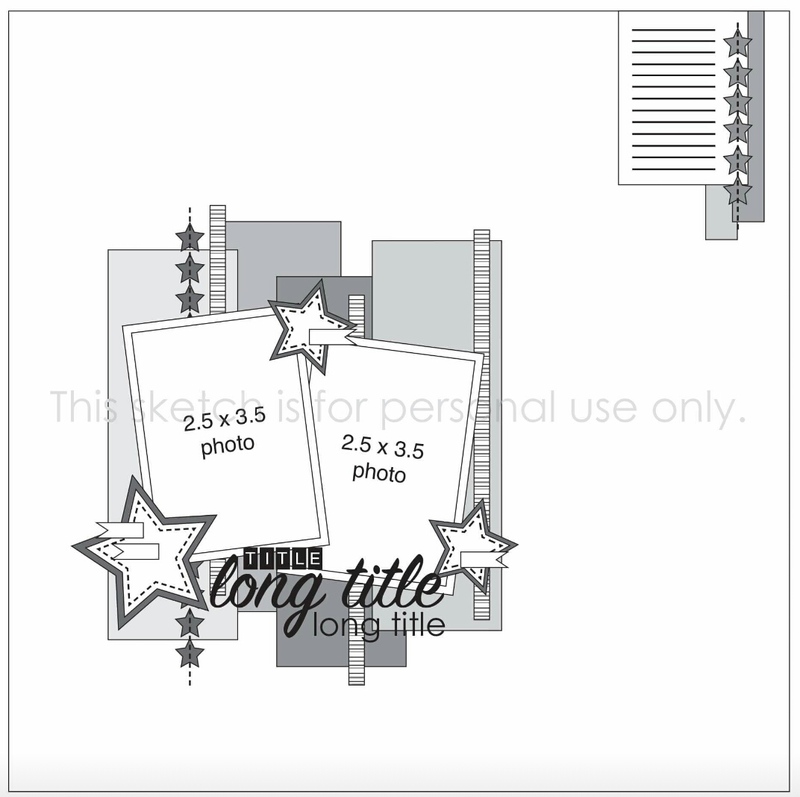 To finish, I cut a few items with my cricut and added journalling strip on antique white cardstock. I started the day off with a treat. I didn’t have to take my kids to school this morning. It isn’t often that I get to start my day by just plunging into my daily chores. I thoroughly enjoyed it! By 9:30 this morning, I’d finished my chores (the main one, anyways), and sat down to play while I waited for my laundry (second main chore of the day) to finish it’s wash cycle. I’m usually just getting home by 9:30. And, this particular routine- doing a little bit of cleaning, then scrapbooking- is nearly a daily occurrence. No, I’m not ashamed to admit it. It isn’t often I have enough pictures from a specific occasion or everyday occurrence to create a double page spread, but this time I did. Even though only one of the twins is showcased in this project, the theme applies to both my children. They were born, started putting on weight and never looked back. They’re now 6, four feet tall (and that’s a conservative estimate), and weigh a good 90 lbs. My children are far from small! A bit like my husband, their daddy. I’ll be the shortest in our family before long. The sketch below inspired this layout. It was also submitted to a challenge that I participated in during an online crop at Scrapbook Generation back on Superbowl Sunday. 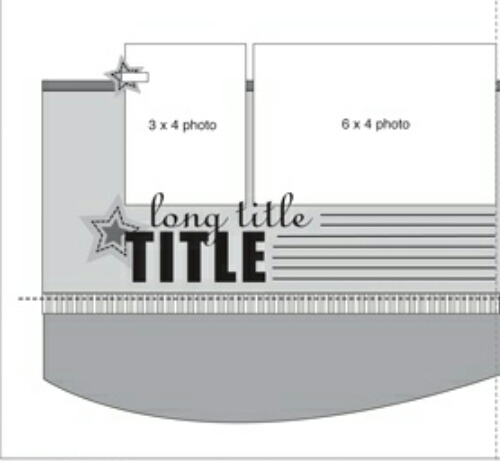 I rotated the sketch 90° making the top photo border an end cap on either side of my design. I did that mainly because I didn’t have four 4×6 inch photos to line the top of my spread with. I used a mixture of CTMH Blossom and White Pines patterned papers, and stamped part of my title and die cut the rest using my cricut.